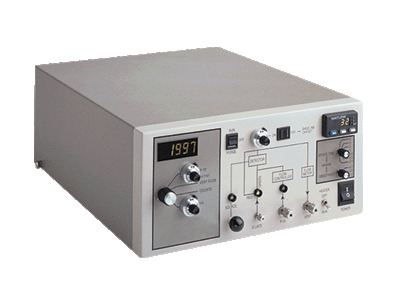 The GC-RAM has been developed to eliminate many problems associated with Gas-Phase counting such as low volatility, condensation between the GC and the radioactivity detector with loss of counts, loss of resolution, increased background and tube contamination etc. Central to the GC-RAM concept is a catalytic reactor closely positioned to the GC column inside the GC oven. 14C containing compounds within the GC eluent are converted to 14CO2 while 3H containing compounds are first converted to 1H3HO which is subsequently reduced to 1H3H gas. That way, there is almost no possibility of condensation or tar formation. Of course, a splitter is required prior to the catalyst chamber if an FID or other mass detector is in use. Thorough attention to detail has resulted in the GC-RAM being capable of quantitating 2Bq of radioactivity at a level of 2.5 x background; lower still with an optional anticoincidence shield. The system can be used with capillary GC's or with packed columns or megabore; carrier gas flow rates can vary between 2 and 40 ml/min.